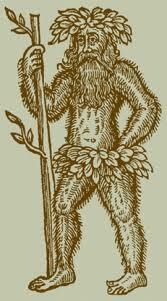 An enduring and well-known figure in English folklore is the Green Man. You'll find his leafy face among the architecture of many a country church, on pub signs, and in folksongs and tales. Less well known is his wild and hairy cousin, the Woodwose. I recently had cause to investigate him closely when I entered a competition held by Badger Ales, my favourite British brewery. They have just opened a new brewhouse, and to celebrate, they've created a very limited-edition beer named Woodwose. To win a few precious bottles they wanted to know how the woodwose relates to Dorset. After consulting one of my essential tomes, The Lore Of The Land, I came up with what I hope is the right answer. Also, the entry had to be in less than 100 words. So (in 99 words) I came up with this. (And to top it all, TP made an amazing folk song out of it!) I hope it wins! To meet with a wild wose. With a gleam in his ancient eye. With a smile that made her sigh. And fled home to her father's mill. Then went back to the woods on Yellowham Hill. And came down alone from the wose's wild.